A 10 to 30 minute daily walk is easy enough to commit to and it may save your life. 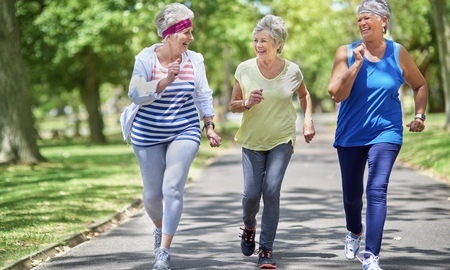 A recent publication says that women who walk briskly for at least 2 hours a week have a significantly lower chance of suffering from a stroke than their sedentary counterpoints. Women who walked at a pace of 3 miles per hour or faster had a 37% lower risk of suffering any type of stroke. Women who walked two or more hours a week had a 30% reduced risk of any type of stroke. A stroke is an injury to the brain due to the interruption of the blood supply when an artery becomes blocked, or a blood vessel breaks. This causes destruction of a portion of the brain tissue that can lead to weakness, numbness, paralysis, speech difficulty and confusion. Uncontrollable risk factors include hereditary, age, gender, and medical history. However, there are a number of risk factors that you can take power over rather than letting them take over you. These include: heavy drinking, smoking, high blood pressure, high cholesterol, poor diet, physical inactivity, and obesity. Consult your Doctor on ways to get a hold on the controllable risk factors. Smoking cessation aids, treatment facilities, medication, and/or an overhaul of an unhealthy lifestyle may be in order. Another form of control you can give yourself is to try oral chelation therapy from Cardio Renew. By increasing circulation and reducing blockage in your arteries, you help your blood flow deliver rich nutrients and oxygen to all parts of the body.